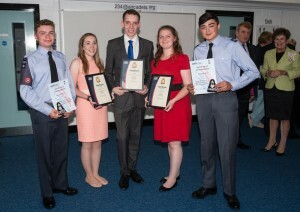 Cadets and staff at 234 (City of Durham) Squadron Air Cadets are celebrating after 3 staff members are presented with Commandant’s Certificates of Good Service and 2 cadets are amongst the first in the country to be recognised for their fund raising initiative. Civilian Instructors Jane Dunn, Matthew Leathard and Megan Thorns, all ex cadets from Durham squadron, were presented with the prestigious award by the Lord- Lieutenant of County Durham, Mrs Sue Snowdon. The Certificates of Good Service are awarded by the Commandant of the Air Cadets, Air Commodore Dawn McCafferty, and recognize the outstanding contribution that these staff members made to the Air Cadet Organization during their time as cadets. As cadets all three recipients gained their Gold Duke of Edinburgh’s award, taking part in the same four day expedition in 2011. In addition all were able to complete the Air Cadet academic syllabus becoming Master and Instructor Cadets passing on their knowledge to younger cadets. Other achievements shared between them include graduating from the grueling Junior Leaders course, completing the Full Radio Operators Certificate and being awarded the Dacre sword for the best male cadet in the UK. At the same event Cadet Corporal Scott Burgess and Cadet Tim Hopper, both aged 15, were recognised by both the Lord Lieutenant and the President of SSAFA Durham, Col Arthur Charlton, for their effort in fund raising for the charity. SSAFA (Soldiers’ and Sailors’ Families Association) is the oldest service charity having been formed in 1885 and has supported servicemen and women from all branches of the Armed Forces through two World Wars right up to the present day. The charity cares for all serving personnel as well as veterans and their families so has an extremely challenging and varied mission. They rely entirely on donations so are keen to honour those who go above and beyond in their fundraising efforts. The two cadets organised a collection on behalf of the charity in the centre of Durham and also set up a stall in the marketplace. They raised over £350 in one day and were also highly successful in raising the profile of SSAFA within the local community. For their efforts they were presented with SSAFA badges by Col Arthur Charlton. These are a new initiative by the charity and are awarded in recognition of exceptional support. Our cadets are amongst the first in the country to be recognised with this award.